Silviniaco Conti added the Betfred Bowl Chase to his victory in Boxing Day's King George VI Chase, drawing fulsome praise from trainer Paul Nicholls. Sent off the 9/4 second favourite, Silviniaco Conti won by one and a half lengths from Dynaste, who won the Grade One Ryanair Chase on his previous start. The Somerset-based champion trainer-elect acknowledged his eight-year-old might one day need the assistance of headgear, for he wandered off a straight line on the run-in when fourth in the Betfred Gold Cup, and did the same approaching the final fence today. Nicholls said: "There is no doubt he stays, but there is just the question of whether he might one day need the help of headgear. At Cheltenham he jumped the last, looked like he was going to win and then ran left and ran a bit of green - then stayed on when they went past him. "Today he was half rolling around a bit and then galloped on when he got to the rails. He just wanders around in front - to me he has always been an out-and-out stayer and that's why we rode him positively today. After the last he galloped all the way to the line, and he can't have had too hard a race at Cheltenham because three or four days afterwards he was fully recovered. "Losing Denman and Kauto [Star] through old age we really needed a good chaser and this horse has done fantastically well winning the Betfair Chase [last season] and the King George. He ran well in the Gold Cup and didn't win it so we'll go back for that next year and take in some other nice races on the way." Silviniaco Conti made amends for his recent fourth in the Betfred Cheltenham Gold Cup with a pillar-to-post victory this afternoon. The 9/4 chance fought off the challenge from runner-up Dynaste after the final fence and stayed on well to record a one and a half length victory. Jockey Noel Fehily was full of praise for the eight-year-old after the race and felt his mount had done himself justice after his near-miss at Cheltenham last month. "He is a very good horse and he deserved to win today. 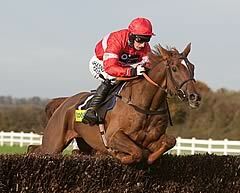 He has been very good to me but I am still very disappointed that we got beat in the Gold Cup," said Fehily. "I didn't sleep a lot that night and I'm still a bit sick that he was beaten at Cheltenham having jumped the last in front. "I think that he likes a little bit of company as he just wandered around a bit before the second last fence today. He likes to go with other horses and I think that's what happened at Cheltenham - when the other horse came wide of him, he tried to go and join them. "He's jumped so well though this afternoon. He missed one out on the back straight but found a leg pretty quickly and he's getting good at putting himself right like that. "It's great that he has won today. I have never been as disappointed as I was when I got beat in the Gold Cup because he was the best horse. He winged the last that day and I thought I was away and going to win but I didn't even finish in the first three in the end." Dynaste was a winner at this meeting last year as a novice and, after storming clear in the Ryanair Chase at the Cheltenham Festival, was beaten a length and a half into second place under Tom Scudamore on his return to Aintree. Trainer David Pipe said of the 13/8 favourite: "He has been beaten by a better horse on the day and there are no excuses. "We can look forward to next season now and I would imagine that the same races will apply - all the conditions races will be open to him and we will then look to Cheltenham again. "I would imagine that will be it for the season and he will probably go out to grass now as he has had two tough races." 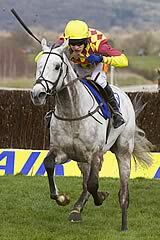 Argocat was the lowest-rated in the field by some way but crept into contention under Tony McCoy to take third. Trainer Tom Taaffe said of the 25/1 chance: "It was a good run and he has ran as I expected him to. "Tony said if he knew him a bit better it may have helped him and he will now go to Punchestown for the Bibby Financial Services Punchestown Gold Cup. "The horse had a terrible fall at Down Royal early in the season and came back with all manner of injuries and it took us two months to get him trotting again so he has done well." The Betfred Bowl was first run in 1984, originally designed as a consolation prize for horses which were beaten or had been unable to participate in the previous month's Cheltenham Gold Cup. The inaugural running was backed by Perrier-Jouët, and it was titled the Perrier-Jouët Champagne Cup. For the following three years it was sponsored by Whitbread and called the Whitbread Gold Label Cup. Subsequent sponsors have included Martell (the Martell Cup, the Martell Cognac Cup) and Betfair (the Betfair Bowl). Totesport began supporting the event as the Totesport Bowl in 2008 and the sponsorship was taken over by Betfred in 2012 after that company purchased The Tote in 2011. The race was promoted to Grade 1 status in 2010. It is currently held on the opening day of the three-day Grand National meeting.